One conservationist has been arrested and a further arrest is likely this afternoon, at the protest taking place in Butlers Gorge. Approximately 11 police arrived at the protest just after 3:30pm today. One person who was locked onto the gate was removed and arrested. All other protesters left the area, except the tree-sitter, who remained in the tree. Police Search and Rescue are attempting to remove the tree-sitter. 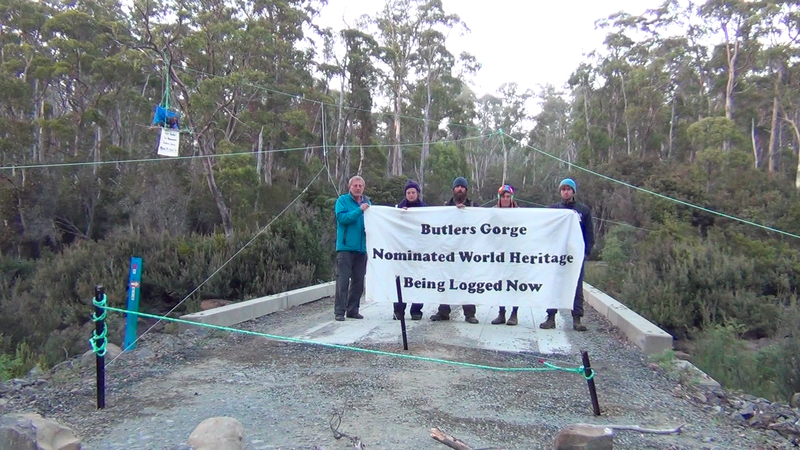 “Dedicated conservationists have today put themselves in a position risking arrest in order to stand up for the World Heritage nominated forests of Butlers Gorge. These forests are being logged at an alarming rate, despite the Australian Government’s recent nomination to have them listed as World Heritage” said Miranda Gibson, spokesperson for Still Wild Still Threatened. “The protection of these forests of outstanding universal value is supported by people around the world. Over 40,000 protest emails have been sent in the past few days targeting Burke and Gillard and calling for an end to this destruction” said Ms Gibson. “Despite today’s arrests, Still Wild Still Threatened will continue to take action to bring an end to the logging of these globally significant forests” said Ms Gibson. Posted on February 20, 2013, in Media Releases. Bookmark the permalink. 1 Comment. Lala got her temporary 1000 jobs, even if most were fly-ins from Perth or on 457 visas. It’s the Labor media announcement, the media announcement, the sizzle not the steak! Lala’s Tourism ignorance can’t see that Tarkine Tourism is long term, will employ many more than 1000 and the jobs would be Tasmanian, the jobs would be permanent careers, and employees and local smal businesses would have income stability to pay mortgages, unlike short term contract miners. Alas it’s all Lala through the Looking Glass, isn’t it? We have not abandoned you. We remain in earshot deep in the forest of friends.